We're happy to announce that the ParadeSmart App, part of our basic offering, is now available on the Play Store and Apple's App Store. Big thanks to the folks at Velocity Webworks for all their hard work and excellent software craftmanship to bring these apps to the public. Most of the apps that we at ParadeSmart provide are custom built for the specific parade, using their colors, logos, styles, and other features that our clients like. However, not every HBA can afford a custom app. 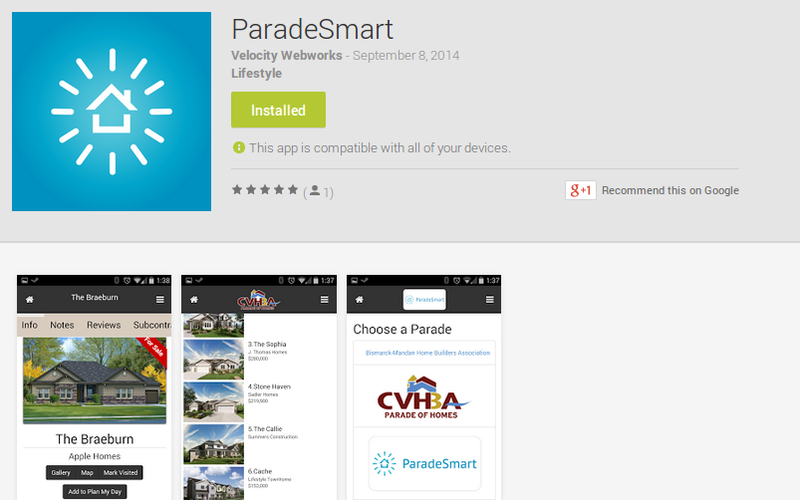 The new ParadeSmart App is very affordable, at just around $700 per parade for unlimited number of homes. Those using our basic package direct their parade guests to download the ParadeSmart app rather than a custom built app for their HBA. Those signing up for ParadeSmart are given access to a dashboard that allows the HBA to input all of their home details for their upcoming parade. There are no limits to the photos per home or the amount of detail you wish to include for each home. Our friendly staff is available during work hours Monday through Friday to walk you through any questions you might have. You're also given a dedicated project manager to offer training and guidance through the process. Our goal is so that you have a worry-free and successful Parade. Basic (which is what this blog post is about) for $699, regardless of the number of homes you have in your parade. This is ideal for smaller, free-for-visitor parades. Custom App for $699 plus $99 per home in your parade, for a custom-branded app experience plus some additional features that aren't available in the basic app such as restaurant maps, ad management, unlimited pages, etc. Custom App plus Ticketing plus Point of Sale for $699 plus $299 per home. This package includes all of the features above plus customizations, and in addition to ticketing, a point of sale process for ticket sales on your website, in retail stores, and at the door. To read more about our packages and what we offer, see the Features page of our site.